Amanda's private cooking classes are the fastest way to improve your skills. She specializes in tailoring the class to match your current knowledge and then take your skillset to the next level. Let Amanda share with you her over thirty years of diverse experience. You name it, she can teach it. Specializing in ethnic, world cuisine Amanda focuses on organic, non GMO ingredients with liberal use of herbs and local produce. 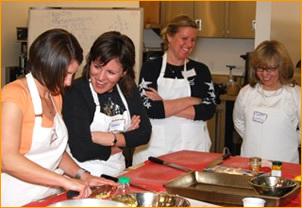 We can organize a fun and memorable private cooking class for everyone to enjoy. She can accommodate from one to twenty people and an average home kitchen is ideal. She enjoys sharing her years of experience, tricks of the trade and perfectly written recipes with others. Amanda offers her very popular classes within Raleigh, Durham, Chapel Hill, Cary, Morrisville, Hillsborough and Carrboro. Let her share her passion with you and help you reach your cooking potential! Amanda Cushman is a culinary educator who has cooked professionally for over thirty five years. Chef Cushman's private cooking classes are offered in Raleigh, Durham, Chapel Hill, Cary, Morrisville and Carrboro. Her corporate team building classes have featured clients such as; Hugo Boss, Experian, Exxon Mobile, Google, Yahoo, Fitness Magazine, DirecTV and Toyota. 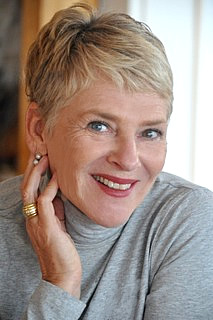 She has developed hundreds of recipes for cookbooks and food publications such as Food and Wine, Cooking Light, Vegetarian Times and Fine Cooking. 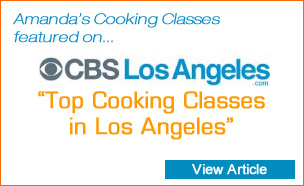 Amanda has been featured on television in LA, NYC and CT offering cooking demonstrations and expertise on a variety of food related subjects. 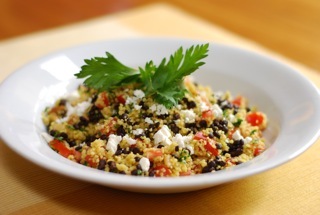 No experience is required for Amanda's NC private cooking classes. Amanda will guide you through techniques to match your currently culinary knowledge from learning how to use a chef's knife to classic French skills. Chef Amanda offers one-on-one or group classes to include, friends, family and colleagues. For prices and menus contact chef Amanda directly at 310-980-0139 or amandascooking@gmail.com. All private classes include a menu consultation via email or phone, recipes, a detailed shopping list, a complete meal and instruction. Students are responsible for shopping and a travel fee is required for distances over 30 minutes. If preferred, Amanda is available to shop for a fee. If you have a group that is more than twelve people we can arrange for that. We will customize the class for your group with a consultation via email or phone. Amanda, Just wanted to again say Thank You to you for introducing me to the exciting world of cooking. I honestly was not sure what to expect when I started out but I can tell you that you have now created a culinary monster! I am finding myself not only enjoying creating meals in my waking hours, but actually having dreams about Knife 101 practicces in my sleep (and unfortunately I'm being dead serious!). It has been a joy so Thank You!!!! I wanted to thank you for an absolutely delightful, informative, and delicious class. You did an amazing job of engaging everyone( we were a large group) but keeping it comfortable for the different levels of culinary comfort of each person attending. I certainly plan to attend future classes of yours. Amanda will arrive forty five minutes before the private class begins, at which point she will set up the kitchen with a station for each recipe. All the ingredients will be arranged according to the recipe and your friends will arrive with their enthusiasm and appetite. They will be briefed on the menu and a short demo will be done for important cooking techniques. Her private cooking lessons include an extensive repertoire of cusines ranging from Thai to Tuscan. The class is organized to work with the standard household kitchen. If there is an unusual kitchen tool needed, Amanda will bring it with her, along with tips on where to buy the item. All levels of experience are welcome, and there is always a feast to enjoy at the end. You will go home with a set of recipes and a new confidence in your cooking abilities. Please contact Amanda with further questions or to signup for a private class. Many private cooking class hosts would like to arrange for gift bags for their guests; this can include customized aprons, kitchen utensils and a signed copy of Chef Amanda's new cookbook Simple Real Food. Gift certificates for private cooking classes are also available for any occasion such as weddings, baby showers, anniversaries or birthdays. 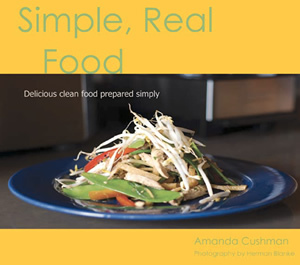 "Simple, Real Food: Delicious clean food prepared simply"
My cookbook Simple Real Food can be purchased online. The price is $24.95 and the book can be sent to your home or office. It can be included with a gift certificate for a cooking class as the perfect present.